The above sword is described in an article Early Medieval Cutting and Stabbing Weapon, a Palash Sabre (6th-7thC) from the NMH's Collection by Nikolay Hrisimov (pdf available). Total length: 64 cm, blade length: 55 cm (single edged), hilt: 9 cm, width at the hilt: 32 mm, at 20 cm from the hilt: 29 mm. It is possible that originally the blade was longer, but after a collision with a hard object it was broken and later reshaped (see its unusual tip). According to the article such weapons were popular in the 6-7thC in the whole Eurasia, from Japan till the Carpathian basin, from Kama River till Iran, the greatest concentration of these swords was found in the Carpatian basin, during the early Avar period (580-670). Out of 193 finds 115 swords are in good enough shape to allow identification of cutting edges, and 68 are single edged swords. The Avar sabre from Igar (Hungary), last decades of 7thC. Total length: 98.5 cm, max. width: 3.3 cm, length of the crossguard: 5.8 cm. Single edged with a short false edge. 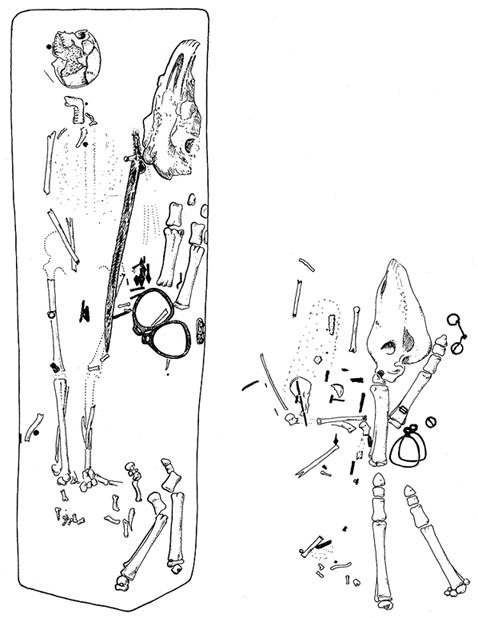 Very similar sabres from the middle Avar period (670-720), sometimes called Avar-Bulgar period, were found at several other locations in Hungary: Baracs, Dunapetele I, Jánoshida, Kecskemét-Miklóstelep, Székesfehérvár-Kuruchegy, Ozora-Tótipuszta. Gyula Fülöp Az igari avar kori vezérleletek (1987) (51 pages). A short summary of his PhD thesis (1985): A közép avar átmeneti kor kérdései az igari vezérleletek és a Fejér megyei régészeti leletanyag tükrében. A fresco (1321-1322) from the Gračanica monastery (Serbian Orthodox monastery located in Kosovo). I have been unable to find out more about this saint (Nikita, Saint Nicetas?). There is an interesting feature on the blade next to the crossguard. I have come across a superb article Military Sabers of the Qing Dynasty written by Philip M W Tom. And bingo! Suddenly that special "thingy" at the forte has a proper technical name: tunkou in Chinese. The only difference between these two sleeves is the direction of the longer part: the Serbian version covers the back of the blade while the Chinese the edge. Upper sabre: Willow leaf sabre (liuyedao) and scabbard, China, late 18th—beginning 19th century, blade 73.2 cm, yuanshi style fittings (scabbard associated) in bronze with filigree work on hilt. There are several threads about tunkou on swordforum. Philip Tom wrote: The tunkou has an entirely different origin, as evidenced by its shape. This feature first appeared on saber blades made in various areas of inner Asia during the Middle Ages. A considerable number of backsword and saber blades uncovered in the Yenisei region, western Siberia, dating from approx. 9th cent. onward, have this feature (see Yu. S. Khudyakov, VOORUZHENIYE YENISEYSKIKH KYRGYZOV / armament of the Yenisei Khirghiz, Soviet Academy of Sciences, Siberian Branch, 1980). A magnificent example of a Seljuk (Turkish) saber blade, thought to have been made near Herat ca. 1200, has a blade profile and a tunkou which could almost pass for a Ming or Qing liuyedao were it not for its decoration. It is published in ORIENTAL SPLENDOUR: ISLAMIC ART FROM GERMAN PRIVATE COLLECTIONS (Museum fuer Kunst und Gewerbe, Hamburg 1993). Tunkou were most often made of iron or brass, although I have seen silver and baitong ("white" brass, cupronickel alloy) examples as well. They can be a very tight press fit onto the blade, or else they are made to fit snugly yet slide off without much effort. Since the edge side is longer than the dorsal, the blade shoulders are cut asymmetrically to enable the tunkou to fit against the guard without shifting fore-and-aft. The asymmetrical form is what distinguishes a tunkou from a habaki, although their function is similar. On some Chinese blades, the tunkou is part of the blade itself, comprising a shaped raised area at the forte. There are a few examples in which the tunkou, here being merely a decorative feature, is but a design which is inlaid into the forte in gold or silver. There is a saber made for a "doroi beile" or Imperial prince of the third rank with an import Japanese blade inlaid in just such a fashion, in the collection of the Metropolitan Museum of Art. The use of the tunkou was not universal on Chinese sabers. It was fairly common on early Qing blades, but its use decreased during the 19th cent. In his article - Military Sabers of the Qing Dynasty (1644-1911) - the author mentions a "saber blade with guard of medieval Eurasian type, excavated in Eastern Europe, probably 9th-10th century AD, blade length 83.2 cm. Note the tunkou or sleeve at the forte. (Author’s collection)." Philip Tom wrote: The tunkou serves a similar function on a peidao as the habaki does on a Japanese blade: it helps stabilize the weapon's handguard, and enables a snug, positive "seating" for the forte of the blade when the weapon is fully sheathed. Ideally, when the blade is in the scabbard, it should be supported by the wood at only two points: at the tip, and at the very base of the guard. By having "air space" around the blade every where else, the surface can be protected from scratches (during field service and combat, all kinds of dirt and unwanted foreign matter can enter the mouth of the scabbard). Also, in rainy weather when even the most-carefully-seasoned wooden sheaths can swell, there is less chance of the blade being stuck fast in the scabbard. Blades designed without a tunkou can still be made to fit well into a scabbard. Distal taper, with the forte being considerably thicker than the rest of the blade, can be utilized to advantage in fitting a scabbard. A skilled scabbard maker can design the blade channel, and the crucial two or three inches at the throat, in a number of ways to fit many blade configurations, including the niuweidao (ox tail sabers) which are notably wider towards the tip. I've seen enough old scabbards in good condition to have been able to learn these techniques myself. One last thing. THE TUNKOU DOES NOT DERIVE FROM THE HABAKI, OR VICE VERSA. Perish the thought, folks, it just ain't so. Archeological evidence places the origin of the tunkou in Central Asia. Sabers and backswords made by various peoples, primarily of Turkic culture, between the 7th and 13th cents. AD often have this feature, which looks not at all unlike the Chinese versions of the 16th through 19th cents. I guess it could be just fire gilded decoration like in the so called Charlemagne saber. The sabre has both: a shorter sleeve (impossible to say on which side: true edge or back) and a longer inlay part. But the sleeve is of a very similar shape to the picture. Sleeve then. A sabre from the Hungarian National Museum with a gilded silver hilt and scabbard. 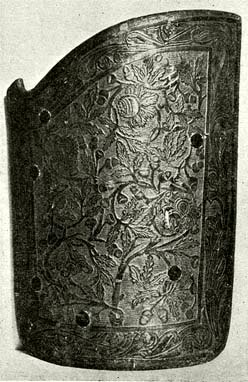 The oldest depiction of a hussar can be found on its scabbard. The oldest depiction of a hussar. please, forgive my ignorance, but why is it believed to be a hussar? Is not a heavy lance what he is wielding? Usually people associate hussars with light cavalry units of the Napoleonic Wars, or of the War of the Austrian Succession etc., but the first hussar units were established much earlier, during the reign of King Matthias Corvinus (1469-1490), or even a bit earlier by his father. So yes, early hussars were equipped with a heavy lance, an asymmetric shield, a sabre, sometimes with an estoque etc. There are some great images from between 1500-1550. Just one from a Wiki article (around 1550). A hussar shield which is very similar to the shield depicted on the scabbard. Around 1480. Wood, covered with parchment, gilded ornaments. "Huszárpajzs pergamennel bevont fából, benyomott és aranyozott díszítéssel. 1480 körül." It would be interesting to know which date should be used as the cut-off date for medieval sabres. "Depending on the context, events such as Christopher Columbus's first voyage to the Americas in 1492, the conquest of Constantinople by the Turks in 1453, or the Protestant Reformation in 1517 are sometimes used." "The end of the Middle Ages can be characterized as a transformation from the medieval world to the early modern one. It is often considered to begin in 1300, though some scholars look at the mid- to late-fifteenth century as the beginning of the end. Once again, the end of the end is debatable, ranging from 1500 to 1650." Hungarian historians use 1526 (Battle of Mohács) as the end of the Middle Ages. Because sabres at that time were essentially Eastern weapons, it might be appropriate to use that date. A Hungarian sabre (the turn of the 10th century, Transsylvania (Erdély)). A more detailed Hungarian description of the above sabre from Kolozsvár (Erdély).